Picture it. Monday evenings after the first day of a new work week, a rustic dinner is waiting for you after work. Does it sound too good to be true? Perhaps, but it’s not my little doggy imagination working over-time. Niche’s Rustic Monday Dinner is back! And this little doggy did a happy dance on my way to the restaurant last night. 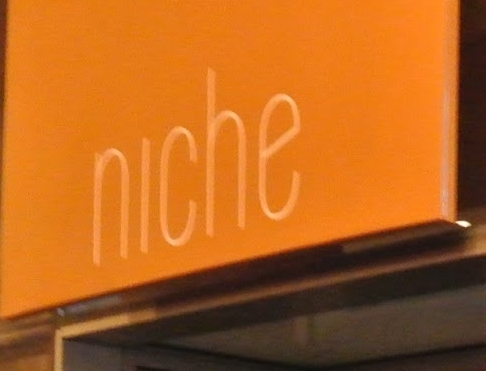 For those who don’t know about Niche’s Rustic Monday Dinner, it’s a three-course meal for only $35.00 per person. It’s the best $35.00 you will ever spend for a meal in St. Louis. Let me break out for you last night’s food experience. The first course was a new and exciting twist on a caprese salad as only Niche can do. Chilled, blistered cherry tomatoes, perfectly prepared slices of eggplant, mozzarella cheese and basil pesto all served with a balsamic reduction, oh and I dare not forget the toasted bread crumbs sprinkled over the top. The second course was a choice between brick chicken or braised lamb. I selected the brick chicken. It was perfectly cooked with skin on, lightly seasoned and melted in your mouth. It was served with small toasted pasta and charred squash. I’m not sure what the sauce was but it was silky, complex, and delicious. The third course was a pear tart, but again, a tart that only the talented folks at Niche could create. The crust was thin, flaky without being greasy. The pears were roasted inside the tart, and then it is turned upside down and baked a second time with a bourbon caramel sauce. It was served with house-made vanilla ice cream. Needless to say I cannot wait to find out what the menu will be next Monday, but you can bet that I will be there with my napkin and cocktail in paw.